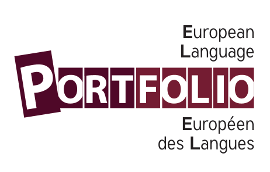 The European Language Portfolio (ELP) was introduced as a concept in 1991 together with the Common European Framework of Reference for Languages (CEFR). In 2001, it was formally launched by the European Council. The European Council sets the general political direction and priorities of the European Union – this includes educational priorities. Promoting plurilingual and intercultural education, respect for linguisticand cultural diversity, mutual understanding beyond national, institutional and social boundaries, and the development of the autonomy of the individual citizen — those were the priorities, which the European Council emphasized in its language education policies. The portfolio is a vehicle for individuals to record and document their skills, knowledge, and experiences with and in multilingual environments in a form that is accepted across Europe. The ELP consists of three parts: the Language Passport, the Language Biography, and the Dossier. The Language Passport: In the Passport, the learner provides an overview of their proficiency in different languages at a given point in time. They can list their language qualifications and their experience of using different languages, and their contacts with different cultures. The Language Biography: In the Biography, learners set goals for learning, they reflect on their language learning and their experiences when using their language. They also self-assess their progress towards achieving their goals and what they can do with the language. 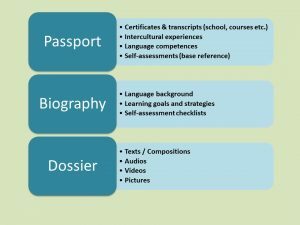 The Dossier: In the Dossier the learner selects the materials which document and illustrate their achievements or experiences which they recorded in the Language Biography or the Passport. The Dossier includes examples of personal work that illustrate language competencies and skills. Note: The European Council dedicated a special website to the European Language Portfolio. There you will find many documents describing its history and policies and you can view some examples. There are also specific resources on Developing an ELP, including some templates that can be used when compiling an ELP. Note: After years of trialing the portfolio with different age groups and students from different educational levels, the European Centre for Modern Languages (ECML) explains that there is no single ELP. As learners have different backgrounds and different experiences, the actual content of portfolios varies.